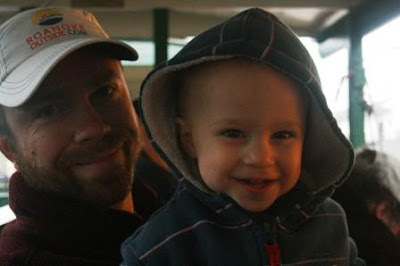 Ever since Paul and I rode the train up to NYC last fall (so that I could run the marathon) Pierce has been begging to ride on a train. We looked into riding the train up to D.C. but to be honest, with luggage and logistics it would've been so much easier to drive. 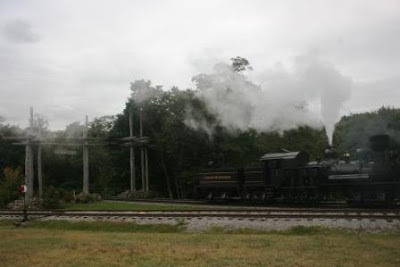 Then one day I was flipping through a magazine and saw an ad for Cass Scenic Railroad in WV. This sounded like a fun way to let Pierce experience a train. 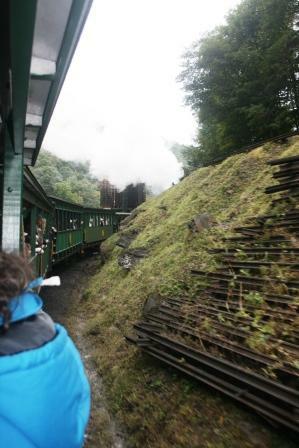 The train was awe-inspiring with the black smoke billowing out the top. The twins were not impressed. The moment it rolled up and let out that LOUD rush of steam they both took off running for the woods, screaming the whole way. We wrestled them down and got them on the train. Cort recovered quickly and started enjoying himself, as seen below. Reid - not so much. He was scared. 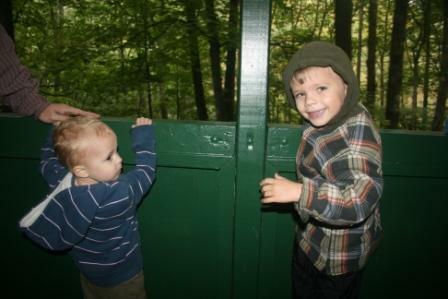 As the train chugged up the mountain, the kids were able to walk around as they pleased. They enjoyed watching the beautiful scenery going by. 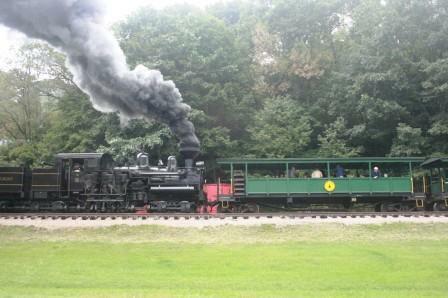 The train moves slowly - less than 9 miles an hour, so there is plenty of time to watch and relax. Our round trip took about 4 1/2 hours. There were tons of other little boys on the train, and Pierce made several friends during the trip. On the ride up, the train stopped at Whittaker Station. Beautiful views, and a historic logging camp to check out. It was a gloomy and cold day for pictures. Even bundled up we were still chilly. This is how I spent the ride. Poor Reid. He was so terrified. I confess that even though I didn't want him to feel scared, I certainly enjoyed 4 hours of snuggling. 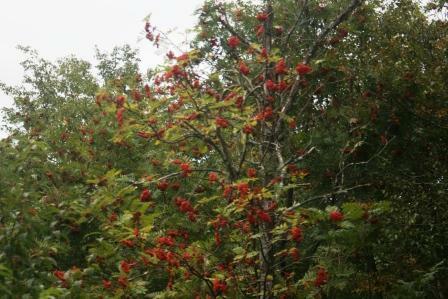 The Mountain Ash berries were thick and ample. Paul said that there is a bug killing these trees, and they will eventually be extinct. 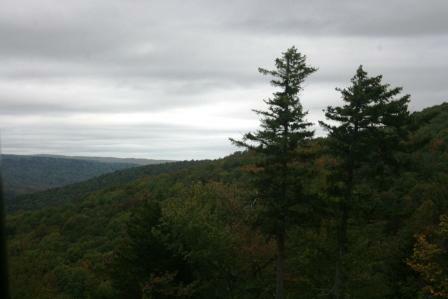 I think the word "scenic" in the title Cass Scenic Railroad is well earned. 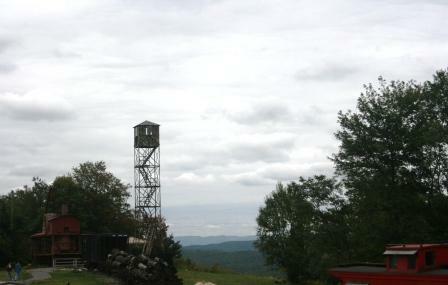 Finally we arrived on top of Bald Knob, at around 4700 feet. It was cold! The boys posed for a pic on the observation deck, but note that Reid wasn't going to let down his guard for a second. He knew that scary old train was still there. Doesn't the observation deck look like something out of Survivor? 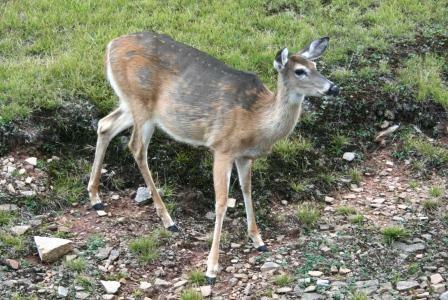 There were several deer on the mountain that were very friendly. We saw a few that were eating out of people's hands. Finally, we began our descent down the mountain. Reid was willing to get off my lap a few times, so long as he was still holding on to my leg. The view - as the train went around a curve. As our family of five snuggled up under the warm blanket we'd brought for the train ride on the final stretch back to Cass, we definitely (well, except maybe Reid) thought it was a fun day, and one that we'll remember for a long while! If you're a breastfeeding mom, please check out my giveaway from Milk Nursingwear for a $40 gift certificate here! Poor Reid! This just sounds and looks like the perfect kind of day to me. What a great mini escape. LOL.... I can just see your boys turning tail and running for the woods. Trains are noisy and for a little boy, they can be really scary. I love snuggling. It looks like a wonderful train ride. The scenery is so pretty. What a wonderful family day! Well except for little Reid. Moms will take snuggle time when ever they can get it! Love the capture of the smoke in the first picture! Looks like a good time. Nice shot of the deer as well! wonderful fun filled family day, nothing tops it. 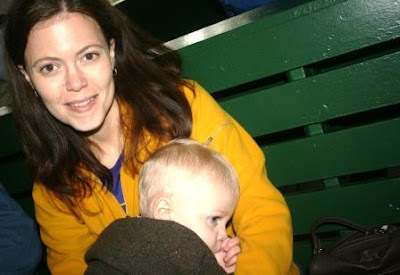 maybe reid's great memory will be of snuggling with mom!! i love trains and the sound of the whistle. there is something so comforting about it!! and the thought that most peeps are going home!! How awesome that there are still places where you can travel by train. What a fun day! Poor little Reid. Amazing how quickly the trees are changing. Of course it is that time of year. I hate that about the Mountain Ash. That sounds like every little boys (well almost) dream! What a beautiful scenery! Everything is so green! Never realized how brownish Utah is until now. 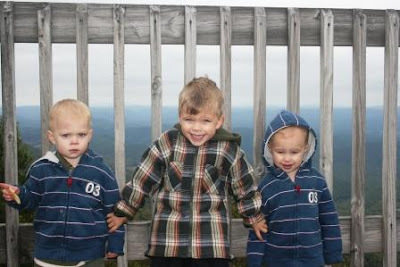 Your kids are adorable. What a great idea for a family outing! 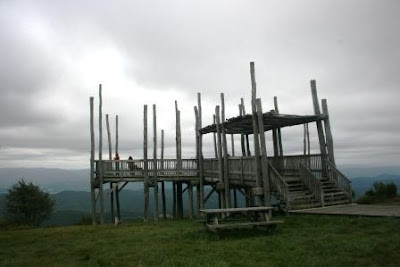 That observation deck looks a little iffy to me. Poor Reid has terror in his eyes in that picture. I rode this train when I was a kid! Looks like it was a lot of fun, and definitely scenic-that part of the country is so beautiful! Looked like a beautiful time! Poor Reid, sorry he was so scared but at least you got some cuddle time in! sad about the Mountain Ash Berry trees though..
That looks like a great day for everyone, except for little Reid. Though he's so cute! I'm thinking he'll love looking back at these pictures someday. We have a train about an hour away from my house. I know my 3-year-old would LOVE it. We took steam train rides every summer at various places when I was a kid growing up. I still remember it all very fondly and Cass is a great one that they will def remember too! Train rides are wonderful! What beautiful scenery, too. Your boys are so handsome! You and your husband always do such fun stuff with your three musketeers! We rode the Whitepass Railroad up the mountains in Skageway, Alaska-I love the scenic view atop the mountains and the thrill of the ride! what an amazing day! I too would love a train ride! Yes, I know about the ash beetle. Too bad we can't stop it. The smile in the second picture and snuggles - can't beat it. Great trip. We haven't rode the Cass yet. We'll have to do that one soon. Looks like a great one. Poor Reid. Maybe he would like the Potomac Eagle better. We rode that one a few years ago. It was great! Took my mom and my Granny who was 85 at the time on that trip. Forget the kids, I love a steam train! We have a tourist train like that down here and I learnt to never put my head out the window as I'd get my face covered in soot! That looks like so much fun, even if it was chilly out! Beautiful too! Hopefully Reid enjoys it more the next time. Oh Lisa, I cannot believe we just missed each other by ONE day... We were in Lewisburg on the 17th--and drove up to the Scenic River Gorge area that day.